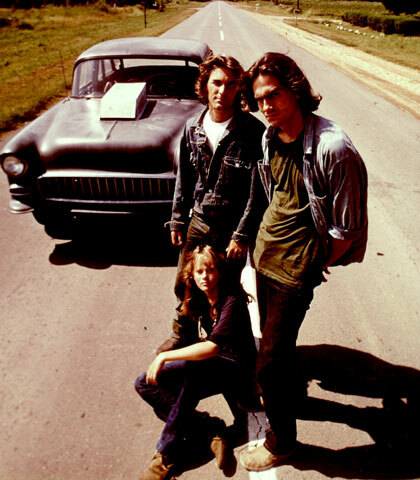 There’s a great interpretive clue for Two Lane Blacktop hidden in the scene where Warren Oates–probably the most underrated actor of his generation–puts on the car radio for a hitchhiker and out comes an instrumental version of the tune “John Henry.” We see GTO slyly watching the face of his passenger, gauging his reaction, seeing if he gets it. The film, too, tells a story about man and machine, or better yet man-made and machine-made. The Chevy is like the mechanical embodiment of the old weird America Dylan archived on the Basement Tapes, and the GTO and its driver stands in for the relentless gravitational pull of mass produced, plastic uniformity. What irony, then, that at the end GTO appropriates the car and the story that comes with it. I wish I could remember the line exactly, but he says something like “nothing feels better than beating one of those slick new Detroit machines.” If, as you suggest, the Chevy is the demythicized “Great While Whale” of this film, then what we see in the end is Ahab on tour with its taxidermically preserved body. On a broader level, this speaks to the wholesale reification of American “heritage”–a pose in which it is all too easy for the wolf that ate the sheep to hide underneath its flayed skin and whisper its story to anyone who will listen. Good review, but one correction: Warren Oates’ character GTO drove an orange 1970 Pontiac GTO .